The user is able to see (after two 'warnings' on how it works) the 'market value approximation' directly in the listings. The service actually provides two different values. The value is calculated through a AVM (Automated Value Model) from the Swedish company Ljungqvist Information AB. The input to the model is a large number of comparable sales that is combined with data from each unique listing regarding parameters like location, size, monthly payment and so on. More of 'Mechanical Turk' approach letting agents not involved in the listing have a say about the value. The coverage for this service is much more limited. When displaying a listing there is new page showing both values (if they exists). I think this is a great move from Booli. It will create buzz and increase traffic. There has for a long time been a topic on the Swedish market (especially in Stockholm) regarding the low 'listing price' on objects. This will give more input to the analyze done by the buyer. However, AVMs also have a negative side to it, it's just an approximation and not an appraisal (external valuation) for the specific object. Read more on the topic of AVM downside here, here and here. Booli really tries to make the users aware of this. There is not one, but two, warnings you have to 'click through' in order to active this service. 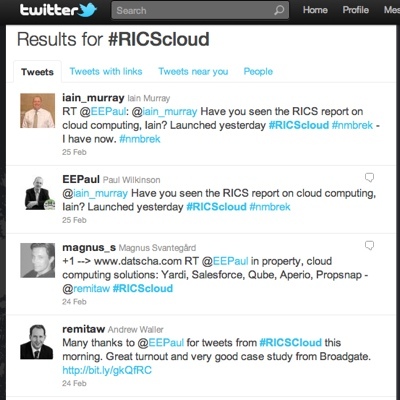 Last week, at a breakfast meeting in London, the RICS paper on 'The role of cloud computing in Commercial Property' was released. A paper written by my friends Andrew Waller and Bob Thompson at the real estate management consulting firm Remit Consulting. The writers aim to both give a background, potential but also the 'dark clouds' of the cloud based services and at the same time give 'real' examples of cloud services used within the UK property market. For example, did you know that CB Richard Ellis has deployed Salesforce CRM and the Force.com platform to create their own management platform in order to simplify the management of a construction project? Unfortunately I didn't have the time to travel to London to be part of the conversation (I'm located in Stockholm...) but thankfully, there was a hastag for the event on Twitter! Take the opportunity to read the paper. Even if you're aware of the cloud trend, since the most interesting part is the examples. By the way The Financial Times write a piece on it. On the 24th of February RICS (The Royal Institution of Chartered Surveyors) arranges an event in London on the topic of 'Cloud Computing in Commercial Property'. This free event at RICS at 0830 on Thursday 24th February will consider how property advice will take account of how clients will change working styles and the property they use to reflect Cloud computing. The entire site has a much more modern look. Compare with the existing version (www.hemnet.se) or my post about it with its release last summer. When start writing in the search box additional parameters are displayed. As marketed before, one is now able to search multiple cities or streets in one search. The list of results is cleaner. The new object information page. For more details, the user is redirected to the brokers main page for the listing. As far as I am concerned Hemnet has added following new functionality. Direct in the search box, see above. For apartments (Co-ops) a total cost, including a potential financing set up, is displayed. For sure a more modern feeling using the service and it's more user friendly. However, I was hoping for more features, especially after been looking at the earlier mock-ups. Hopefully, there is more to come. There is soo much more that could be done to making the process of home searching more efficient. More on that topic in a later post. Yesterday at the SIME conference (hyped Internet event in Stockholm with focus on media) Hemnet announced that they are developing an iPAD application to be released in spring. 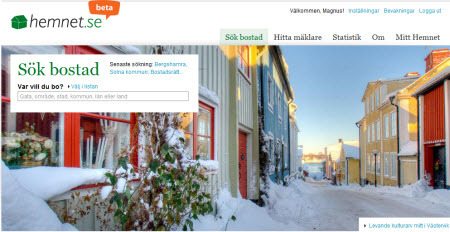 Hemnet is the largest residential listing service in Sweden. The development firm Apegroup will build the app (they've also built the iPhone and Android app for Hemnet over the last year). An additional feature is that it will be possible to save photos on the iPad for inspiration for future decoration projects. "... the iPAD app could also be used as a tool for the brokers/agents to present alternative listings during an open house"
Having tried US based real estate iPAD apps like Zillow (residential) and Loopnet (commercial) I believe this move by Hemnet is a clever one. My suggestion would be to create a specialised version of the iPAD app for the brokers/agents in order to give them a great presentation tool in their meetings/open house with the clients. Take a look at this video for Zillows iPAD app (CEO Rich Bartons blog post about it) and read this success story and you will see the benefits. At my day job as Product Manager at Datscha, I've used iPADs extensively over the last couple of months running short sales presentations at different events/conferences and it is working brilliantly. It's easy and almost invisible to bring with you, starts in a second and you can quickly flip through a presentation (mostly used PDF over Dropbox). I could just imagine how great it would be for a real estate agent with a dedicated iPAD app like above. 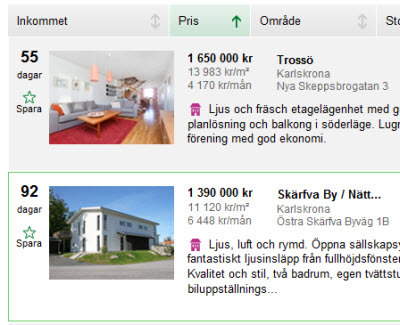 What a coincidence, the same week as a debate started on the blog Future of Real Estate Marketing (an Inman company) why (or if) 'the map based search was dead' an absolute stunning new search tool was launched on the Swedish market called BostadsPivot ('RealEstatePivot'). A software developer named Magnus Ohlsson has used the Silverlight control PivotViewer combined with listings data from the Booli API (a Swedish residential listing service) to create this tool. 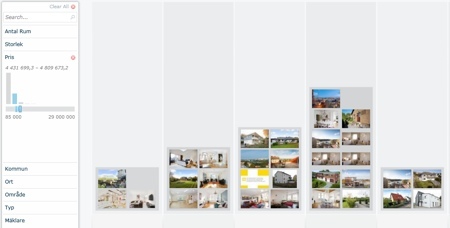 Hard to explain the tool in one picture but each photo represents one listing the different columns are in this case the representing different price intervals. It's for sure worth trying. And for all non Swedish speaking here is the short manual. In the panel to the left one decides how to limit the search. 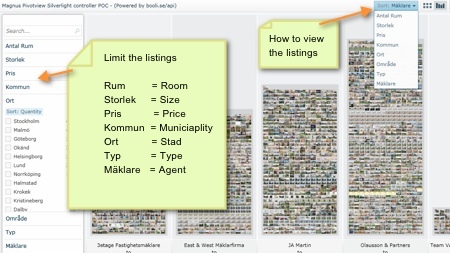 In the drop down menu in the upper right corner one choose how to 'group' the listings. And finally there are two icons (upper right corner) for how to view the result. Read more about the tool at the developers blog (in English). Where you also find more information about the PivotViewer, including a great TED presentation on the topic. First of all, the PivotViewer technology is impressive and this example for sure takes advantage of it. It gives a new way to browse the listings. The downside is to make it as user friendly as needed for the average user. Furthermore, the integration of a map could be better. However, the use of technology is brilliant. Other listing services will hopefully be inspired by this. 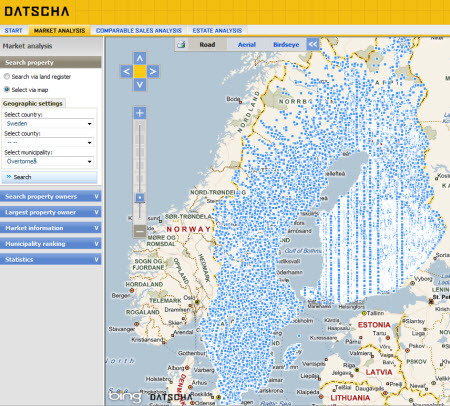 Datscha, the Swedish SaaS solution for the commercial property market, launched last week it's services in Finland by adding data on 140 000 properties and market information for 7 municipalities (to be 50 soon). 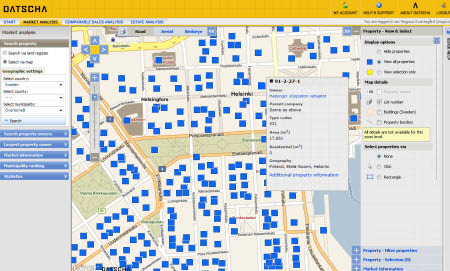 The data to be found on all commercial properties in Finland includes id, owner, type code, land area and total size of the building. Below is the rather useless, but all so cool view of all the 510 000 (!) commercial properties in Sweden and Finland. Makes much more sense when zooming in. On a detailed level the user is able to do a 'mouse over' on any property icon and see the id, owner and type code. There is also a link for more details. As in Sweden, market data from a consulting firm is available in order for the user to getting a better understanding of what office sub markets that exist and their rent-, vacancy- and yield-levels. Is found at www.datscha.com and through the press release (in English). One of the great (small) challenges in business life is all the silos of data within an organisation. For example, the property information in the property management software that could be useful to have in your CRM system and through the growth of standards there may be a solution in sight. However, standards don't just pop-up. They are the result of some serious hard work and timeless efforts to put them in place. A standard is an agreement between maybe 100s of counterparts that first of all not may be aware why they need it (!) or want it (software suppliers making it harder to switch supplier). That's a tough starting point. The second is that everyone is doing their business in an unique way making it hard just to have a common understanding of 'what is included in the rent?' or 'what type of area is it?". Luckily for the property industry there are organisations driving the work of standardisation. The largest effort internationally is run by OSCRE, which is a merge between an US based organisation (OSCRE) and a UK one (PISCES) a few years back. Their effort is nowadays not limited to any particular country. See some of there larger projects listed here. A great interview with Stephen Spooner, the Executive Chairman of OSCRE, is found at crePodcast. Some examples on the benefits of standards. A great examples is from the large commercial real estate consulting firm JLL described in a PISCES case paper. Jones Lang LaSalle has devised a lease administration system to manage its clients’ portfolios. Originally information was transferred to this system from lawyers using paper-based systems. This traditional approach required specialist staff to extract the data, was monotonous for those involved, and therefore prone to error. In contrast, when the PISCES Lease Standard was developed it became possible to take lease data direct from law firms straight into the lease administration system. Using PISCES, ambiguities are minimised and the responsibility for data is more clearly defined. Definitions are often unclear with paper leases but with PISCES there is more precision, because the data standard defines that if a data field is populated in a particular way it carries a precise meaning. Found a video showing how standards are used in the underwriting process. The fi2 has created a PDF with existing solutions at companies like ABB Fastigheter and Regionfastigheter. Why not sign up at www.OSCREiForum.org (hosted by CREOpoint) and join the discussion? The different standards have today reached the point when the main problem is not to make them work, but to convince firms to start using them (or demand suppliers to put them in place). This is a challenge of marketing and selling. I believe the only way is to SHOW existing real time solutions (like the video above). Then also to focus the 'sales' towards the large investors & banks who then will show the benefits for (/put the pressure on) all other parties in the industry. Cause like always, money talks. Finally, to all you people out there working within the area; keep up the great work. There aren't to many conferences or events focusing on the benefits of smart use of IT in the real estate industry. But there are two, Realcomm for the commercial part of the industry, and the Inman Connect Conference for the residential part. In a months time the Realcomm London will take place (20th October). "Realcomm London is a networking and educational event for commercial and corporate real estate technology professionals. This unique “by invitation only” event will focus on global best practices that pertain to technology, automation and innovation in the property industry." The focus on the event will be “SHOW ME THE ROI: Using Technology to Increase Revenues and Decrease Expenses”. SharePoint: Real Property ITs Secret Strategic Weapon? Over the last 24 months, SharePoint has taken the world by storm, and the property industry is no exception. The versatile yet powerful platform has given organizations the ability to automate tasks never before considered while encroaching on applications traditionally developed by the vendor community. In this exciting session we’ll explore some of the new features of SharePoint 2010 and demonstrate some innovative applications for the property industry. Until recently the concept of a "connected" building was just emerging. Over the past year we’ve seen a significant number of positive signs in this space; major agreements signed, new multinational vendors joining the industry, vendor revenues matching GDP growth, but most importantly, a number of legitimate, quantifiable case studies. This update will showcase the most significant, smart, connected projects from around the world focusing on both the challenges and the ROI opportunities. It has become very apparent that large multinational firms with portfolios in different regions around the world have specific and complex needs. Issues such as master data management, integrating data from multiple property systems, and regional differences in data definitions often result in a lack of data transparency and costly, inefficient reporting processes. In this session we’ll discuss and debate options for building stronger transactional, management, and reporting systems in global property organizations. The CRC Energy Efficiency Scheme mandated this past April will have a profound effect on all public and private property owners and investors in the UK. This mandate will require the half-hourly monitoring of energy consumption in buildings and will impact the cost of energy to both small and large portfolio owners. Managing energy in one building is complicated enough but the issues become even more complex as multiple buildings are added to the equation. This session will address the technologies required to manage the CRC processes and will also discuss the concept and implementation of a centralized command and control center. If you have the possibility you really should make it to this "complimentary “by invitation only” event that brings together commercial real estate practitioners to discuss and debate global best practices that pertain to technology, automation and innovation in the property industry". I've been to four Realcomm events over the years and Jim Young and Howard Berger always manage to exceed my expectations. I'm often caught up in discussions about 'the cloud', web based, SaaS and so on. There seems to be a lot of confusion and different understandings around this topic. I believe the strongest reason is the marketing part. Never underestimate the eager to sell old stuff in a new package. The 'cloud' was also the perfect excuse to create events and for journalists to write articles. Probably the most common 'cloud' service is the 'Software as a Service' (the name was started to be used in 2001). Instead of installing the software on your computer, you only 'run' it in you web browser. (No installations or upgrades.) More commonly known as 'web based' or 'Internet Based'. Of the different cloud versions, this is the only one the end user every will see. Examples of SaaS services are Projectplace (Swedish collaboration tool), Fortknox (Swedish accounting 'software'), Real09 (property management tool), Squarespace (brilliant blogging platform) and, of course, the most common examples, Salesforce (CRM) or Google Apps (email and more). More examples at OpenCrowd. This one is a bit trickier to understand for many end users. A 'platform' is for "application development and delivery". In other words, this is a service used by companies to create and deliver SaaS solutions. "What Does It Take to Develop PaaS Apps? A lot less than it used to. To develop software, you once had to buy databases, servers, networks, and a host of development tools. And then you needed the staff to install, optimize, and maintain it all. With PaaS, you can avoid those investments and focus on developing applications instead." Examples of PaaS are Amazon AWS, Google App Engine and Salesforce Force. This level is all about the foundation of running a software in the first place. For example, servers and storage. Examples of IaaS are Amazons AWS services like EC2. Read more about IaaS here. Is ASP the same as SaaS? Two concepts that are similar but have some differences. "One instance of a software running suitable for the one customer". "A single software will serve many clients." An ASP supplier commonly focus on a packaged-base approach (for example, they could offer many different solutions from different software companies) while SaaS takes product approach. An ASP provider need not be a manufacturer of the product, but a SaaS solution has been designed, built, delivered, configured and implemented normally by a single party who has total control of the system. However, it is quite common for providers of 'old' client/server products to offer their solutions as an ASP solutions from their own data centers, but still one instance per customer. In other words, no SaaS. A great paper on the difference of ASP and SaaS is found at Luit InfoTech. I recommend to ask the supplier if they are able to set a demo account within 15 minutes. If they can't, they aren't a cloud supplier. Is web based always SaaS? As always when something is popular and in the press, "everyone" wants to shine. However, a service could be web based but not (according to me) in 'the cloud'. This is when a software is installed locally and the reached using a web browser. Yes, it is web based but not part of 'the cloud'. Below is a great example of this from a 'cloud' supplement to SvD (one of the two largest daily papers in Sweden). 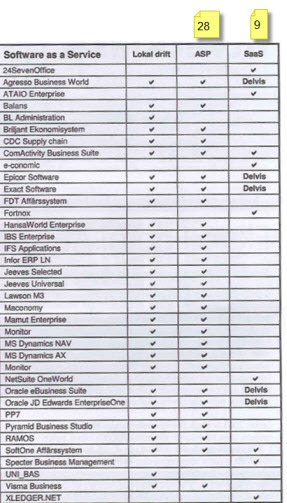 Out of 37 services listed, only 9 was actually 'cloud' services! The rest were ASP solutions. Nothing wrong with that, but it ain't the cloud! If talking to potential clients, keep it as simple as possible. Start using the word 'web based' and if they still (?) are following you, there may be reasons to explain a bit further more exactly what type of service you delivery. However, don't forget that the user is first of all interested in the benefits.